These numbers reflect estimated student expenses for the 2019-2020 school year. Amounts will change slightly from year to year, but as the cost of college increases, the scholarship packages will correspondingly increase. Your official financial aid award will be included in a letter directly from Yale. Outside scholarship funding may be used to reduce a student's campus employment option of $2,850 and then the standard student share of $1,600. If total outside funding exceeds $4,450, students may ask the donor organization(s) for a deferment to subsequent academic years. Outside funding in excess of $4,450 that are not deferred will reduce the Yale Scholarship. You will be required by the University to have adequate health insurance. You will receive primary care services at no charge at Yale University Health Services through Yale Health Plan (YHP) Basic. You will be automatically enrolled in YHP Hospitalization/Specialty Care coverage. The cost of YHP Hospitalization/Specialty Care coverage is included in your financial aid award. This is subject to change in future years depending on financial need. Travel allowance is determined by Yale and will vary depending on the student's location. The average amount is $700, but may be different per student, which will affect the amount of Yale scholarship to cover the travel. Students must maintain satisfactory academic progress requirements of Yale students. Upper-level students have a slightly higher expectation from campus employment and standard student share, that go towards overall college cost. Currently, sophomores, juniors and seniors contribute $3,350 from campus employment and $1,600-$2,600 from the standard student share. 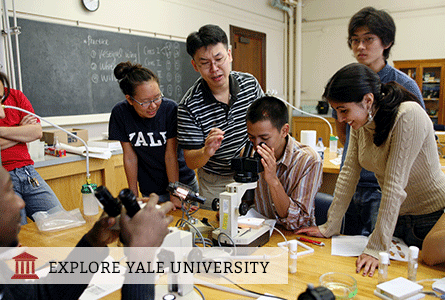 Yale is accessible to talented students regardless of their family's ability to pay for college. We are committed to working with families in determining a fair and reasonable family contribution and will meet the full demonstrated need of every student for all four years. All financial aid is need-based; there are no athletic or merit-based awards. For families with total income less than $65,000 per year, Yale typically does not ask parents to make any contribution whatever toward the cost of a Yale education. In assessing need, Yale does consider family assets, business ownership and other special circumstances in addition to annual income. Yale will only offer admission through the National College Match to students whose parents qualify to make zero contribution to college costs. (Students who are not eligible for a zero parent contribution will be considered for admission to Yale in regular decision and will still qualify for extremely generous aid calculated to meet full financial need, with no loans required.) All Yale students with financial aid awards that include a zero parent contribution also receive a $2,000 “start-up fund” for the first year, $600 annual supplements in subsequent years, and free Yale hospitalization insurance coverage, (provided their level of financial need remains the same each year). Yale does expect first-year students to contribute $2,850 annually toward the cost of their own education through an on campus work-study job of about 8.5 hours a week. Yale's hourly minimum wage starts at $12.50 per hour. Students must also contribute $1,600 from their summer earnings in their first year. Depending on a family’s demonstrated financial need in future years, the summer income contribution will either remain at $1,600 or increase to $2,900 for sophomore, junior, and senior year. Outside funding may replace the student's work-study and summer income contribution. For more information, review Understanding the Student Effort on the Yale Undergraduate Financial Aid website. You need to reapply for Yale's need-based financial aid every year, which will be adjusted to meet any change in need. In addition to family income and assets, Yale takes into account family size (including number of siblings in college), and documented special circumstances (such as extraordinary medical expenses) in determining financial need. Use Yale's Quick Cost Estimator to get a ballpark estimate of your Yale cost in three minutes.